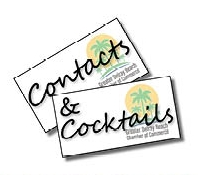 Join us for our monthly Contacts & Cocktails at Delray Beach Elks Lodge 1770. Contacts & Cocktails is one of the best ways to gain a broader awareness for your business and build relationships within the community. For just $15 in advance, and $20 at the door, you'll enjoy cocktails, conversations and culinary delights. Non-members are invited to join in as well at $30 per person.